Call us at 1-800-322-8327 or send an e-mail to bct@boundarycountry.com for more information or to make a reservation. From North America's Nordic heartland-Northern Minnesota, enjoy exciting cross country skiing adventures on the Gunflint Trail. Experience lodge to lodge and yurt to yurt skiing where you'll find world-class accommodations and expertly groomed Nordic trails. A realm with dependable snow from mid December to April. 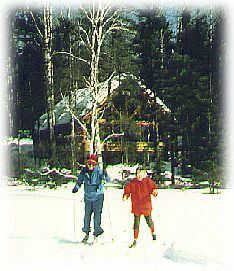 We have conducted exciting Nordic ski vacations in Northern Minnesota since l984. We introduced yurts to the Midwest ski scene twenty three years ago. Snow Country Magazine rated our yurts as one of North America's top Nordic hut systems. And our Lodge to Lodge programs are without equal anywhere. Gunflint Nordic Trails cover 100 square miles along the Gunflint Trail north of Grand Marais. Here you find two inter-connecting systems and the Banadad, over 176 kilometers of groomed trails. The Central and Upper Gunflint offer double tracked trails, many with skating lanes. World-class grooming is provided by three Kasbourer "Piston Bully" groomers. Connecting these two trail systems is the 29 kilometer single tracked BWCAW wilderness trail, the Banadad. At the yurts, meals for you to prepare are provided or a hut host can prepare meals and take care of camp chores at an added rate. Ski Lodge to Lodge and sample a variety of the area's fine trails, some meals and accommodations. Overnight lodging at the modern Little Ollie Cabin, Poplar Creek Guesthouse B&B, the Banadad Yurts, Bearskin, Golden Eagle, Gunflint, Gunflint Pines and Heston's Lodges. Includes overnight accommodations, breakfast and trail lunches (supper is on your own) and car/luggage shuttles. At the yurts, meals for you to prepare are provided or a hut host can prepare meals and take care of camp chores at an added rate. Weekends/Holidays: One night accommodations are not always available. Two night minimums at each accommodation may be required. Ski the Central and Upper Gunflint Trails staying in Lodges along the trail, with option of skiing the Banadad and staying in yurts. NOTE: Additional Trail and Activity fees may be added at some lodges. Ski either the Central Nordic Trails with nights at Bearskin, Golden Eagle or Poplar Creek Guesthouse B&B. and/or ski the Upper Gunflint Trails staying at Gunflint, Gunflint Pines, Heston's and/or Moosehorn B&B. Gunflint Nordic Trails - This 176 kilometer system begins near the mid-Gunflint Trail area and extends 30 miles to the upper Gunflint Trail area. Most of these trails are groomed by "piston bully" groomers and are double tracked; some have skating lanes. Two trails traverse the BWCAW. Overnight lodging at: Bearskin Lodge, Golden Eagle Lodge, Poplar Creek Guesthouse, Gunflint Lodge, Gunflint Pines Resort, Heston's Lodge, a modern ski-in Cabin and the Yurts.